Cristina Gangemi makes an exciting translation of the First Holy Communion programme ‘I Belong‘. 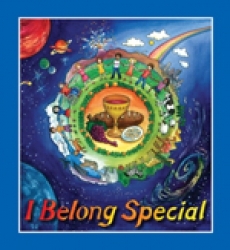 ‘I Belong Special‘ is a translation of the First Holy Communion children’s book which will help children with an Intellectual Disability to encounter the person of Christ. Until now there has been a very ad-hoc approach to ensuring that children of all abilities can sit alongside one another in a catechetical session and engage in the same catechesis, each according to their own way of being and knowing. For children with Intellectual Disabilities visual language which is used to support learning and communication, has to be one that does not have too much information to process, yet enables them to share in the message and activities that each chapter presents. Structure and continuity is vital when catechising a child with cognitive and Intellectual Disabilities. Rather than teach, the advice is to mediate information by following a set process and structure. Christina Gangemi, one of the Church’s National Disability Advisors and co-director of the Kairos Forum has incorporated special education teaching and learning techniques in this book to ensure that all children will enjoy an accessible journey towards receiving the gift of the Eucharist. A creative training programme will soon be avaliable which will help use the resource and share amazing journeys in faith together. Keep an eye on the training page for news.